Fermenting cooked rice is a very old Chinese, Japanese, Korean and other S E Asians tradition, the main use is to make rice wine. 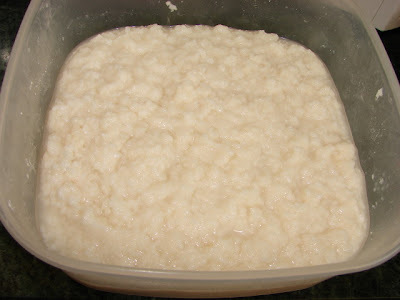 Fresh partially fermented rice is very sweet, great to eat as it is like a rice pudding or use for cooking. In Chinese sweet fermented rice is called 甜酒釀 'tian jiu niang' or 醪糟 'lao zao'. This is not rice pulp after rice wine is filtered. The cooked rice is only partially fermented for few days till it becomes very wet like porridge, very sweet.with a nice fragrance and a hint of alcohol. I have bought this fermented rice in a jar but it is not as good as homemade. The rice used must be cooked glutinous rice and the fermenting yeast must be rice wine yeast. Rice wine yeast is available in some Chinese grocery stores. The are in small pack with 2 whitish balls like this. Sweet fermented rice is very easy to make. Ready to use fermented rice after 5 days. I have given it a stir, does look like thick rice porridge. *This yeast balls I used are made in Shanghai. I find the result is always very consistent and tastes good. There are other rice yeasts available, some in flat cake shape. Different rice yeast may give different result some sweeter and some will produce a sour tasting fermented rice. In Singapore, Malaysia and Brunei you can get rice yeast made by the Malay or aboriginal people, some of their rice yeast are very good some not so good. Soak the rice for 4 - 5 hours or overnight. Drain. Put in a glass dish add enough water to just cover the rice. Steam for about 30 - 40 minutes till rice is cooked through. Can also cook rice in microwave or rice cooker, cooking time will be different. Cover and leave rice to cool. Boil some water leave to cool. Crush the rice yeast with pestle and mortar to powder. Put the rice in clean mixing bowl, loosen with a wooden spoon the rice is very sticky difficult to stir. Sprinkle with boiled cooled water and ground rice yeast to loosen rice and thoroughly mix yeast into the rice. Amount of water needed is about 1/2 cup, a little bit more is ok too. Pour rice mixture into a thoroughly clean glass jar or plastic container. You can make a hole in the centre of the rice (not essential), this will give indication when rice has fermented and juice is appearing in the hole. Cover (not air tight) and leave in the warmest place in your house or next to a radiator during winter time. Check the rice after 2 days (much longer up to a week if room temperature is cool). When the rice becomes very wet and juice collecting on bottom of container or around the container it's ready. Another indication is juice started to collect at the centre hole made previously. 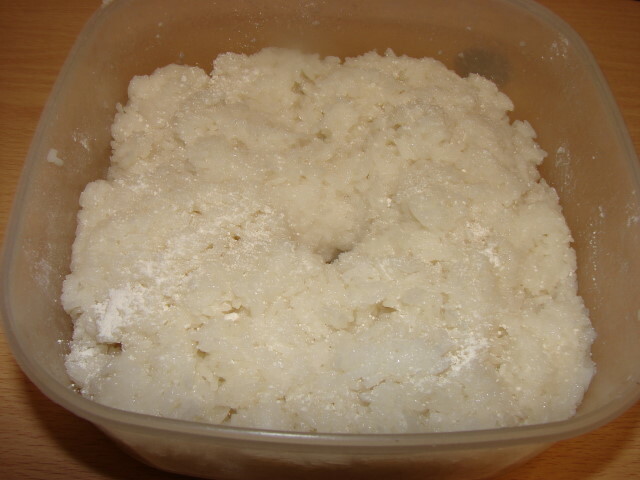 The texture to look for is the rice is soggy like thick rice porridge and taste very sweet. If it tastes sour or too alcoholic something has gone wrong maybe overferment or temperature too high. Stir the mixture, store in clean jar or original container and leave in the fridge up to a month. Do not air tight the jar due to further fermentation. The mixture will continue to ferment so the longer you leave it more alcoholic it becomes when sugar turns to alcohol or become a bit sour when sugar turns to vinegar. So use it when the mixture is still at its sweetest stage. If you are not going to eat it within a month can put some in the freezer. I have fermented this batch for 5 days (longer than normal due to weather is still quite cool) to get the right texture and taste. Sometime it only takes 2 - 3 days if the room temperature is warm. Can eat the fermented rice as it is or mix with some osmanthus flower syrup 桂花醬 or mixed with fruits and fruit juice. Great to add some to Chinese sweet soup, tong sui 糖水 . Another one I like is add some to sweet egg drop soup. I will post some recipes how to use this fermented rice later. Hi..nice to know about this. This is the way I make Tuak or Iban rice wine. But we use a good jar or bottle.thanks. Can I add 'red yeast rice' to this recipe? I guess you can add red yeast (best ground the red yeast grains because fermentation is short). The principal for make lau zao is the same as making traditional red yeast wine, to make traditional rice wine (white or red) fermentation period is longer up to 1 month. Can I use lau jiu (wine) to make ferment rice? I have been reading & making lovely food from your recipes! Thanks for sharing! Not recommended because you need a colony of live wine culture/yeast to ferment. The wine you like to use may have been distilled or heated, i.e. no more live yeast. Hi Sunflower, I have been wanting to make it for so long and now I can try to make it because of your kindness of sharing. Thank you. hi Sunflower, why my homemade rice wine became sour after 30th? still can use it or not? o just through away? As long as the rice pulp is not mouldy, there is no need to throw away. Use it for cooking perfectly ok. There are many reasons why rice wine is sour. One is the type of rice yeast you used. Or other reason maybe temp may be too warm or you jar is exposed to much air. The jar should be kept away from sunlight. Did you fill the jar almost to the top to avoid too much air gap in the gap. Air and heat will covert sugar to vinegar. If you are Chinese there is superstition that making wine during your period can affect the taste of wine. I don't believe this but many people do. Glad I found your blog. Have been looking everywhere for a recipe where I can understand the ingredients and measurements.